A new service has been launched which will help prepare the homes of people who are ready to be discharged from hospital. 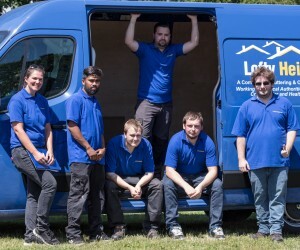 Called Homeward Bound, its introduction will see staff from Lofty Heights, a local not-for-profit social enterprise, provide up to four hours of decluttering so there is space for a hospital bed or medical equipment, that there are no trip or falls hazards and that everything is clean to avoid the risk of infection. People whose home in not suitable to return to can end up staying in hospital longer than necessary. The launch of the service in east Suffolk is another initiative which aims to reduce any delays in discharging those people who no longer need a hospital or community bed environment in which to recover. This 12-month pilot project is commissioned by NHS Ipswich and East Suffolk Clinical Commissioning Group and could support up to 200 local people, with priority being given to those on low incomes, who are socially isolated, without friends or family living locally, or very frail older people that have no living family or friends. Dr John Oates, a GP in Saxmundham and integrated care lead for NHS Ipswich and East Suffolk Clinical Commissioning Group, said: “If there is no space in the home to accommodate necessary medical equipment, or if the home is too cluttered for care staff to attend to a person’s needs, this could potentially cause a delay in a person being discharged from hospital. Deep cleaning areas of the home to reduce risk of infection; particularly in areas where visiting health professionals may be dressing wounds or ulcers. Clearing gardens of overgrown pathways that block access to front and back doors presenting trip, slip and fall hazards to the patient, family carers, paramedics, visiting healthcare professionals and agency carers.